Let’s take a look at reinstalling the front wheel on this Twin Cooled 103 Ultra. Bob points out the left side wheel bearing. It is a different color than the other three wheel bearings on this motorcycle. This bearing is, actually, magnetized to work in conjunction with the ABS sensor/pickup. If front wheel bearings are to be replaced, it is very important that the correct bearings are used -and- used in the correct location. It is acceptable to inspect these wheel bearings by hand. You do not necessarily need tools to determine a bad wheel bearing. Spin the bearing’s inner race with your finger. If the movement feels rough, or seems to have excessive drag, you will need to replace your front wheel bearings. Bob reminds us that the left side of a dual disc wheel is the primary side. That means; if replacing wheel bearings, you will install the left side first. When the left side bearing is seated in the hub, drop-in the wheel’s center spacer, then send in the right side bearing -only- until it contacts the center spacer. If you send the right side bearing in too far (pushing the left side bearing out of its set location), you will have an incorrect offset for your wheel. To mount the wheel; position your ABS sensor and right side spacer. Have your axle prepped with anti seize and slide it through. 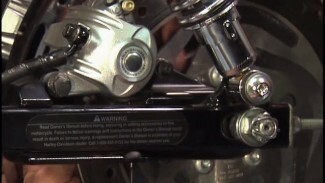 Hold the axle on the right side and locate the ABS sensor so that it is slightly rotated off of the lower leg. Now tighten to 70-75 ft. lbs. Before tightening the pinch bolts on the right, lower slider; it is important that you push in on the slider until it is against the right side spacer. 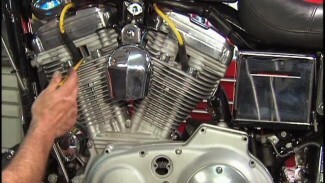 Then, torque the pinch bolts 18 to 22 ft. lbs. Slide the calipers into position and start the mounting hardware by hand. On the left side you also need to install the ABS wire clip. Tighten the caliper mounting hardware 28 to 38 ft. lbs. The correct socket for these caliper mounting bolts is 10mm 12 point. You can also use the box end of a 10mm combination wrench. If you are to remove the caliper pad pin; you will need a 5mm allen. The front wheel of your motorcycle will need to be removed and installed many times throughout the lifespan of your motorcycle. If you maintain, both, components and hardware properly, this service point should never prove to be difficult.